“¡Hola clase bienvenido a tanque de tiburones!” Schork proclaimed. “Me llamo Lori Greiner, queen of QVC.” Schork, with her bright smile and blonde hair made for a convincing Greiner doppelgänger. The reason behind her persona change? 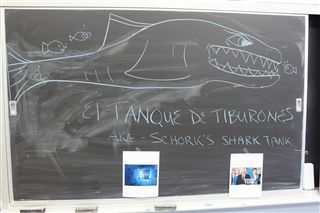 The class’s highly anticipated game of Shark Tank, or Tanque de Tiburones. 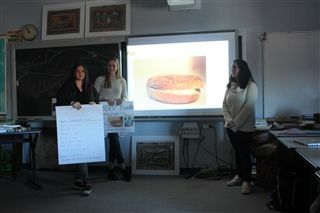 Each group of entrepreneurs was given approximately 15 minutes to present their business idea and product. 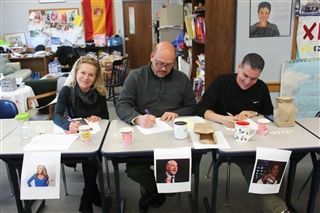 Spanish teacher and Academic Technology Coordinator Juan Martinez sat on the judges' panel beside Schork as venture capitalist Kevin O’Leary. Form Six Dean Ron Garcia served as billionaire Mark Cuban. Ananya Alleyne ‘19, Coltrane Joseph ‘19, and Rabih Chughtai ‘19 were the first trio to pitch their product. Each took their turn at describing, Los Posavasos, a type of pseudo-fanny pack to carry and store drinks and food. 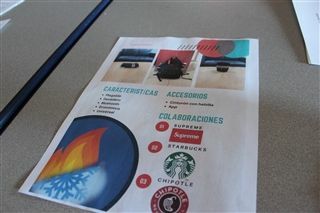 Photos of the packs flashed across the SmartBoard, along with detailed descriptions, ideas for print and online advertisements, brand collaborations, and a minute-long TV commercial. 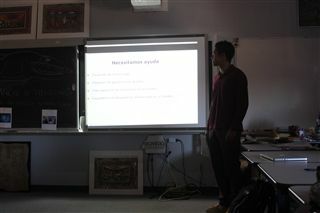 Joseph passed a prototype to the class and the sharks as Alleyne broke down the cost of labor and the final price point. “En el sitio de Amazon, los posavasos son veinticuatro dólares y noventa y nueve centavos,” Alleyne said. The sharks nodded in approval, emphasizing that $24.99 seemed reasonable for the average consumer. Following the presentation, Schork was quick to offer her thoughts on the color of the product. “¡Que feo!” she exclaimed, waving the mock-up in the air. Rather than the dull, black neoprene, she proposed that the product come in more eye-catching shades. The group concurred, adding that they were planning a range of colors to please all patrons. Claudia Petrie ‘19, Isabelle Raymond ‘19, and Elise Genrich ‘19 were next to impress the sharks. The businesswomen shared their innovation, Alarmaretes, unique sets of stud and hoop earrings, each equipped with a detachable speaker. The speaker, they explained, could be synced with any Bluetooth device, allowing users to listen to their favorite music or hear their morning alarms through the earrings. 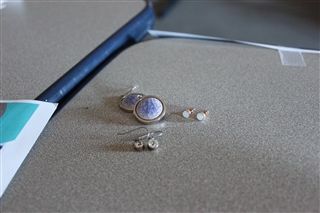 “Funciona con iPhones o Androids,” Raymond said, clarifying that the earrings would be operative for all users, regardless of their cell phone model. Manufacturing would take place in Indonesia with the final product costing $180; $30 for los aretes, or earrings, and $150 for el atavoz, or speaker. “El producto es caro,” Garcia said of the high price tag. Schork voiced her agreement. Martinez however, found the price to be equitable, comparing the earrings to the popular Beats headphones, which can sell for up to $300. “En comparación, es barato,” he said. As the sharks jotted down their notes, Ali Meisels ‘19, Madi Henry ‘19, Lian Wolman ‘19, and Adam Sonntag ‘19 gathered at the front of the room to give the final pitch of the afternoon: Roscas a Ruedas. Loosely translated to Bagels on Wheels, the group aimed to open a food truck that would serve the community with made-to-order bagels and specialty coffee. Each bagel would have a different flavor for the top and bottom along with the customer’s choice of cream cheese spreads. From sesame paired with everything to pumpernickel combined with cheddar, the possibilities were intended to be both delicious and endless. Wolman passed around paper bags of fresh bagels for the sharks to taste, explaining that they would be sold for two dollars per bagel plus 50 cents for any cream cheese. Between bites, Martinez suggested that the entrepreneurs take their business to local college campuses in order to increase publicity and revenue. Schork added that young professionals looking for a mid-afternoon snack in downtown Hartford would also make for good customers. As the students packed their bags and pushed in their chairs, the sharks remained seated, deliberating quietly amongst themselves about the best business models and products. Next class, Schork will deliver the final decisions and announce who the sharks have chosen to invest in as business partners. But until the results are in, the entrepreneurs will adhere to the shark’s words of advice: solo sigue nadando. Just keep swimming. 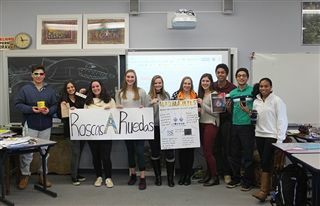 Spanish 5: AP Language is a course designed for Upper School students who are ready to take their passion for Spanish to the next level. Students who enroll in this course take the Advanced Placement examination in May; the challenge of the exam is its precision, its expectation of fluency, and a sophisticated analysis of a wide range of current and classical writings. In class, students are expected to shift seamlessly among aural, spoken, and written Spanish, listen to and interpret dialogues by native speakers, and give clear presentations.